Preheat the oven to 400°. On a large rimmed baking sheet, toss the bread, bacon, potato, onion, butter, oregano and crushed red pepper with the olive oil and season generously with salt and black pepper. Spread in an even layer. Season the chicken with salt and black pepper and arrange on the bread mixture. Roast the chicken and bread mixture for about 45 minutes, until the bread is crisp and an instant-read thermometer inserted in the chicken registers 160°. Serve. Review Body: Delicious Fall entree. I used my homemade sourdough bread. I didn't have lardons but just kept the bacon slices compressed so they were like lardon thickness and sliced into chunks. I subbed thyme, sage, and rosemary for the oregano because that's what I had. The bacon wasn't crispy but that wasn't a problem for me (although I'm usually particular about that) because the bacon rendered to infuse and crisp the bread and potatoes so the hunks of bacon complemented the tender chicken. I served this with the apple pomegranate cobbler for dessert. Not a terribly "light" meal but for cooler Fall weather, a real treat. I'd do this menu for Thanksgiving, honestly! Easy and tasty. Review Body: Excellent, easy, one pan meal. If I do it again I'll probably crisp the lardons in advance, so they are crispier. But it was a big hit with my husband and son! Review Body: Delicious, but next time will brown chicken on stove in advance. Also, I removed chicken at the end and cooked remaining veg/bacon about 7-8 more min to brown and render bacon. Review Body: I'm Italian American. I love travel , great food and I cook a lot ! I love an easy chicken in the oven dish for a fall or cool evening! This met all of my requirements. SO EASY ! I did not have Sourdough, but had tons of good French bread in the freezer. I had prosciutto and some crisped bacon.... so used both! I had small red potatoes not big potatoes.. they worked ! Red onion, chilis and EVOO ? Easy! My only edits.. I pre ' crisped ' the thighs in a skillet and finished in the oven. 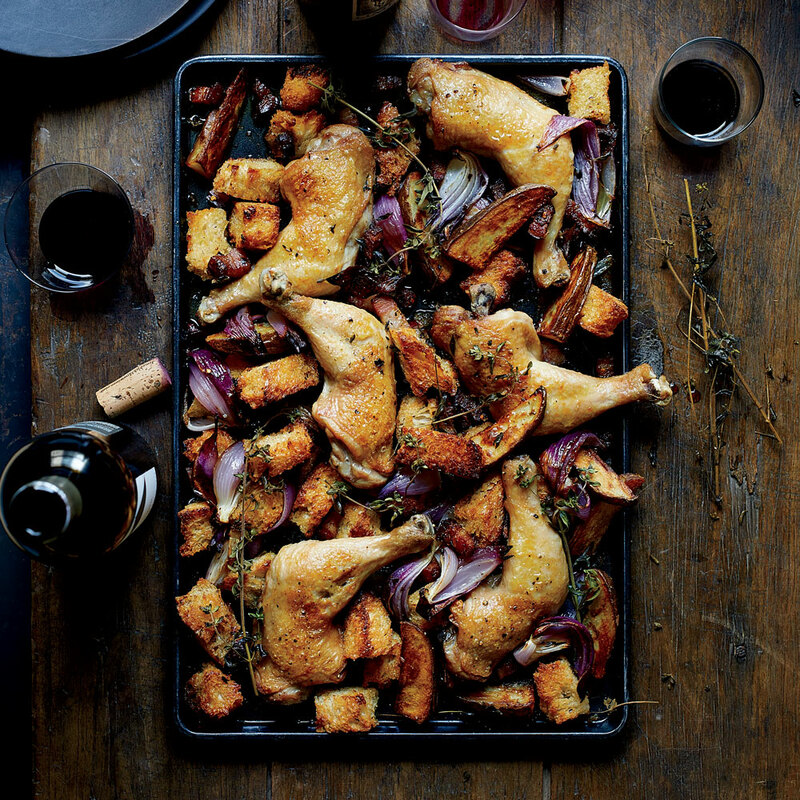 I love the texture of crispy skin , the crouton and then the soft of the potatoes and onion. This dish was perfect just with a nice red and a simple salad. For sure.... I'll do this again.... maybe for company during a foot ball game or on a holiday when I'm ready to sit down and enjoy the day. Review Body: My boyfriend and I made this one night, we added a bit more sourdough bread, onion, and potato to the recipe. It turned out great! Review Body: We made this tonight and it was delicious. I put some of the lardons that didn’t crisp up under he broiler for a minute at the end and used some other herbs that were lying around, but other than that it was decadent and an easy meal for a casual dinner party. Made it with the spinach salad from the same article. So yummy!